Do you want to sell personalised covers? If you don't have an existing website and want to start selling printed covers, a white label webshop is what you want. We offer a pre-coded white label webshop/website-solution all ready to be personalised. 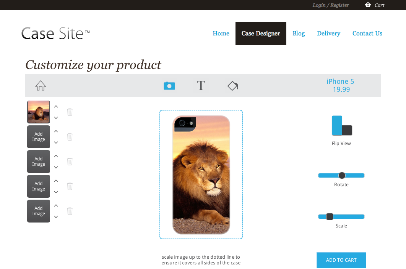 If you already have a website and/or webshop, our white label plugin via API will be perfect for you. Everyone knows that developing a web shop is both expensive and time consuming. We can supply you with a stand-alone white-label case designer that you can plug into your own website via an API. It is quick and easy and requires a minimum of coding. Contact us today to hear more our white-label solutions! Our partners have developed the perfect solution for your convenience, and we are lucky to be able to offer this unique solution to you at a low cost. The site is coded in HTML 5 so it works on both tablets and smartphones. By getting a white-label web shop, you will be able to offer all of your customers a unique product that will not only add value to your own products, but also raise the shopping cart value and give you a chance to differentiate yourself from your competitors. We will produce and ship the products - all you need to do is concentrate on marketing. We make expanding your online business easy - no big investments and no stock required. Do what you do best and leave the rest to us! We only use the best IDT 3D technology available to decorate smartphones and tablet cases. Decoration is full wrap 3D, extending around the 3D surface of the finished part using the highest resolution full colour printing technology available. Big brands choose our technology, because it is the best quality available. By cooperating with IDT Systems and WOYC ApS, we ensure that new case products are continually released in time with device release. We make sure the most relevant cases are available to the market to match market demand. Case products are made from very high specification Amorphous Polymers, the same materials used on space missions and on bicycle helmets. Systems and consumables are produced in an ISO 9000 ISO 14000 environment. They are ROHs & REACH compliant. The printing is done in Europe. All cases are manufactured in Korea for supreme quality and consistency. By working with global producers we ensure highest quality all over the world.